Program Modules will allow you to complete some of the Program's Phase I prerequisites without having to take semester-long classes. to become successful business professionals. Now you can earn the same quality MBA that Eastern Illinois University offers to its on-campus students. EIU’s School of Business is proud to launch the cohort based MBA in a completely online format. 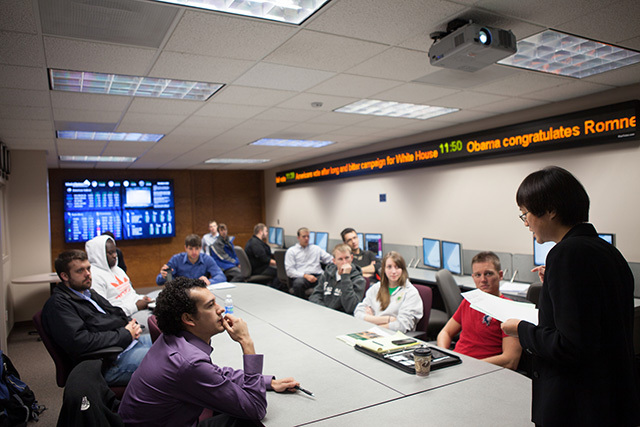 The EIU School of Business is accredited by the AACSB and the MBA program is taught by doctoral qualified faculty. At EIU, we recognize that not you may not have the ability to attend on-campus classes or even stream online lectures at set times. That’s why our online MBA program is asynchronous: our faculty upload weekly recordings of their classes, and you’re free to view the recordings and complete the coursework on your schedule, provided you meet class deadlines. We also offer online MBA students the option to attend classes on our Charleston campus when that option works for them. Students can earn their MBA entirely online, entirely on campus, or through a combination of online and on-campus classes. This level of flexibility is what makes our online MBA program one of the best. EIU’s online MBA program shares a goal with the very first MBA program at Harvard: to train students to think in a broad, comprehensive way. As a student, you’ll take Core classes that develop your problem-solving and reasoning skills, including an advanced Management Simulation course that allows you to apply your knowledge to a series of simulated business challenges. When you pursue an MBA degree from EIU, you’re arming yourself with the lifelong skills that will help you identify opportunities, minimize risk, manage teams, and address challenges in the business world. If you’ve been researching online MBA programs, you’re no doubt looking for a program and degree that will help you advance in your chosen field. EIU’s online MBA can help you meet your professional goals with concentrations in Accounting, Applied Management, and Geographic Information Sciences. You can even choose to pursue a Dual Degree: an MBA with Applied Management and an MS in Cybersecurity. You will find our tuition and fees highly competitive and entirely affordable. You will complete a 33-hour program for less than $23,000, including the $1,000 Commitment Fee. That amount also includes most textbooks with our textbook rental program. The Applied Management Option is focused on “hands-on” development of students’ intellectual and creative capacities. The program addresses a broad range of business-related skills emphasizing a combination of teamwork, writing, contemporary global and ethical issues, and analytical skills that can be immediately put into practice. Click here for more information on this option. The Geographic Information Systems (GIS) Option is designed to support careers using computer systems to capture, store, manipulate, analyze, manage and present spatial or geographical data in a variety of fields including management, logistics, insurance, and telecommunications. Click here for more information on this option. The Accountancy Concentration is intended for students who have completed an undergraduate degree in accounting, and the program will prepare students to meet the educational requirements necessary to take the Certified Public Accountant examination. Click here for more information on this option. We are pleased that we have been able to partner with the MS in Cybersecurity degree program from EIU's School of Technology by offering MBA 5670, MIS 4850, and MIS 4860 as required online courses for those students. Click here for more information on this option. he Research Option is designed for students who want to focus on business research and quantitative methods for research. Click here for more information on this option. We are pleased that we have been able to partner with the Health Promotion and Leadership program. 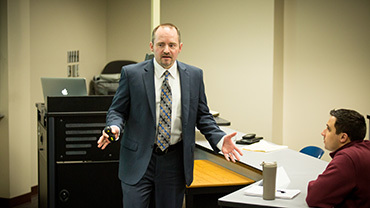 Dr. Dobbs joined the faculty at Eastern in 2009 after teaching at Southern Methodist University (SMU), LeTourneau University, and Arkansas State University. His research and publications are primarily focused on Strategic Management issues related to sport, nonprofits, and small business. 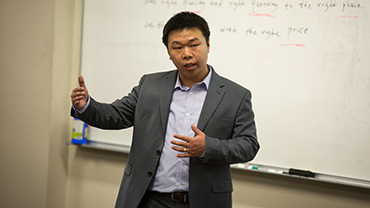 Chao Wen is an Assistant Professor of Management Information Systems in the School of Business at Eastern Illinois University. He received his Ph.D. in Management Science from the University of North Texas. Dr. Wen obtained his M.Sc. with a concentration in Supply Chain Management and B.Sc. in Computer Science from the University of Electronic Science & Technology of China. Mark Bayer is an Assistant Professor of Management at Eastern Illinois University. His research focuses on group cognition and collective creativity. He holds a doctorate degree in Organization Science from the University of Texas at Austin. Before earning his PhD, he spent over 15 years in the aerospace industry as a flight test engineer and engineering manager.